The global border security system market is expected to grow from USD 35,535.55 million in 2018 to USD 58,863.56 million by the end of 2025 at a Compound Annual Growth Rate (CAGR) of 7.48%. The factors attributing to the growth of the market are need for technically advanced border security solutions, rising cross-border infiltration and global disputes, and increasing applications of the unmanned security system by defense and military. However, some factors such as and stringent regulatory environment may hinder the market growth. The global border security system market is expected to showcase the opportunities such as increase investment in defense sector by the emerging economies, and infrastructure supporting the upgradation of the existing border security. In the near future market may face the possible challenges in the growth due to and high cost of r&d and requirement of essential infrastructure for testing security systems. However, the key players in the market are putting regressive efforts to provide innovative offerings and benchmark strategies in the global border security system market. On the basis of environment, the global border security system market is studied across Aerial, Ground, and Naval. On the basis of system, the global border security system market is studied across Biometric Systems, Camera Systems, Command & Control Systems, Laser Systems, Microwave Intrusion Detection System, Perimeter Intrusion Detection Systems/ Intelligent Fencing Systems, RF Jammers, Radar Systems, Unmanned Vehicles, and Wide-Band Wireless Communication Systems. On the basis of industry, the global border security system market is studied across Aerospace & Defense, Automotive & Transportation, Banking, Financial Services & Insurance, Building, Construction & Real Estate, Consumer Goods & Retail, Education, Energy & Utilities, Government & Public Sector, Healthcare & Life Sciences, Information Technology, Manufacturing, Media & Entertainment, Telecommunication, and Travel & Hospitality. On the basis of geography, the global border security system market is studied across Americas, (United States, Brazil, Canada, Mexico, and Argentina) Europe, Middle East & Africa, (United Kingdom, Germany, France, Saudi Arabia, United Arab Emirates, Italy, and Russia) and Asia-Pacific (China, Japan, India, and Australia). The key players profiled in the global border security system market are Airbus SE, BAE Systems plc, CONTROP Precision Technologies Ltd., Collins Aerospace, Elbit Systems Ltd., FLIR Systems, Inc., Israel Aerospace Industries Ltd., Leonardo SpA, Lockheed Martin Corporation, Moog Inc., Northrop Grumman Corporation, Raytheon Company, Saab AB, Safran SA, and Thales Group. 1. Market Penetration: Provides comprehensive information on sulfuric acid offered by the key players in the global border security system market. 2. Product Development & Innovation: Provides intelligent insights on future technologies, R&D activities, and new product developments in the global border security system market. 3. Market Development: Provides in-depth information about lucrative emerging markets and analyzes the markets for the global border security system market. 4. 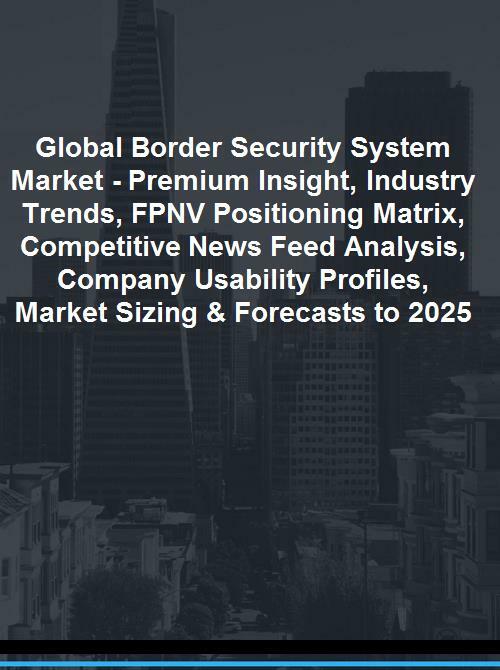 Market Diversification: Provides detailed information about new products launches, untapped geographies, recent developments, and investments in the global border security system market. 5. Competitive Assessment & Intelligence: Provides an exhaustive assessment of market shares, strategies, products, and manufacturing capabilities of the leading players in the global border security system market. 11.3. CONTROP Precision Technologies Ltd.
11.7. Israel Aerospace Industries Ltd. The global border security system market is expected to grow at a Compound Annual Growth Rate (CAGR) of 7.48% from 2018 to 2025 to reach USD 58,863.56 million. In the report, we have covered two proprietary models, the FPNV Positioning Matrix and Competitive Strategic Window. The FPNV Positioning Matrix analyses the competitive market place for the players in terms of product satisfaction and business strategy they adopt to sustain in the market. The Competitive Strategic Window analyses the competitive landscape in terms of markets, applications, and geographies. The Competitive Strategic Window helps the vendor define an alignment or fit between their capabilities and opportunities for future growth prospects. During a forecast period, it defines the optimal or favorable fit for the vendors to adopt successive merger and acquisitions strategies, geography expansion, research & development, new product introduction strategies to execute further business expansion and growth. 1. What is the market size of border security system market in the global? 2. What are the factors that affect the growth in global border security system market over the forecast period? 3. What is the competitive position in the global border security system market? 4. Which are the best product areas to be invested in over the forecast period? 5. What are the opportunities in the global border security system market? 6. What are the modes of entering the global border security system market?